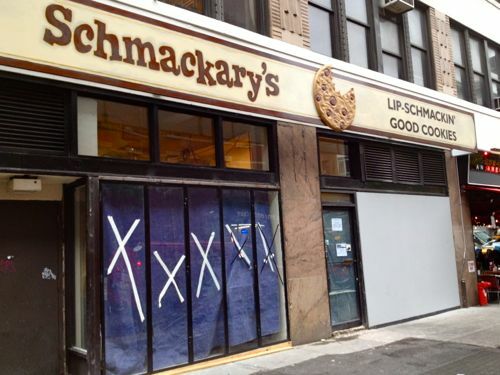 The old Piece of Chicken [spot] has been signed by the cookie outfit Schmackary’s, which will be their first storefront. Probably not as affordable as the Treats Truck (we miss you Kim! ), but I’m interested in a new sugar fix near my office in Times Square. In case you don’t remember, Piece of Chicken, was that very affordable but out-of-bounds fried chicken joint at 630 Ninth Avenue that closed in 2010. It’s a bit of a hike to get there, but we are excited to potentially have a new reason to walk all the way to Ninth! Posted by Rachel Goldner at 1:40 pm, May 4th, 2012 under Sweets.